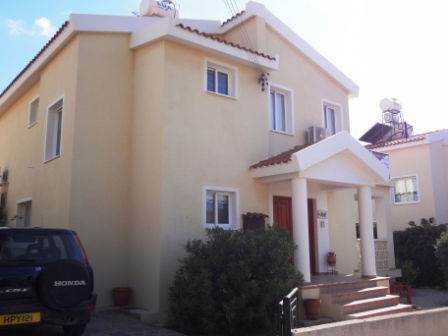 Cyprus Property Blog by Cleo : Price Reduced - Chloraka Villa walking distance to the beach! Chloraka Village, Paphos - This spacious home is located in the popular village of Chloraka, in a nice residential cul-de-sac. The local supermarket is within easy walking distance, together with a variety of village shops and amenities. The beach is a 10 minute walk, and Paphos Town is 5 minutes by car or bus. The property is in excellent condition. The front entrance has an attractive tiled porch and two large double doors. These open into a light spacious lounge and dining area, with three patio doors. There are two verandas - one covered. The smaller covered veranda can be accessed from the dining area and lounge, and the second large veranda from the lounge and separate kitchen. At the base of the stairs is a large guest toilet with tile surround mirror, and a separate storage cupboard with plumbing for washing machine. The well equipped kitchen is huge, with plenty of cupboard space It has more than enough space to be used as a family room/office also, and has easy access to the large veranda overlooking the garden - ideal for outdoor dining. Upstairs there are three double bedrooms all with patio doors and plenty of storage space. The master bedroom has an en-suite shower room with tile surround mirror, double shower, vanity unit and additional storage cupboards. The second and third bedroom share a big family bathroom, also with vanity unit and tile surround mirror. A large terrace is accessed from the master and second bedroom, and bedroom three has it’s own private balcony. The landscaped garden, with decorative stone feature, is mature and low maintenance, and has a built-in barbecue for outdoor entertaining. There is a gated driveway for parking. The finishes in this property are good quality and it has been well looked after by the current owners. The property is ideal as a residential home, or for those wishing to have a holiday home without the cost of maintaining a swimming pool.